Weeknights are such a busy time in our house. There seems to be so much going on and not a lot of time left for preparing dinner. 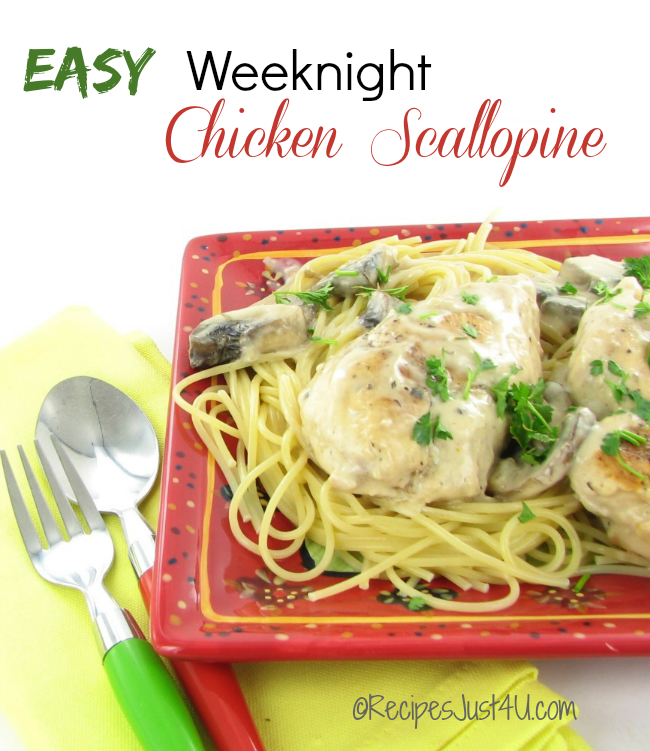 This easy weeknight chicken scallopine is perfect for nights like this. It is delicious and so easy to prepare. It’s the best of the best in my collection of 30 minute meals. Don’t let the time making this chicken scallopine fool you. 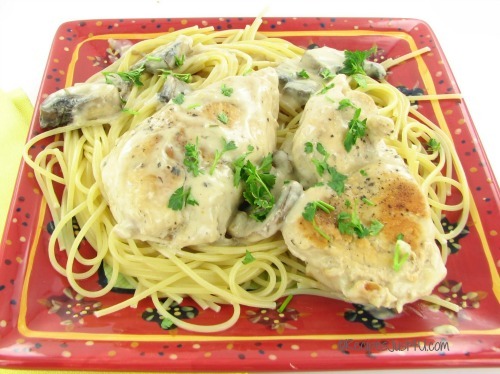 The chicken is moist and delicious and the pan sauce is worthy of sharing with guests. I always buy boneless skinless chicken breasts when they are on sale, so that I can pull them out for busy nights. This cut takes so little time to cook. It is perfect for a busy weeknight. The hardest part of this recipe is just pounding the chicken so that they will cook quickly, but some saran wrap and a meat tenderizer makes that easy. Serve this with a side salad, or some home made garlic bread for a wonderful meal that your family will ask for again and again! Cook the pasta according to package directions in boiling water. While the pasta is cooking, place the chicken breasts between sheets of saran wrap on top of a cutting board and pound or roll with a rolling pin until they are about 1/4″ – 1/2″ thick. Season well with Kosher salt and cracked black pepper. Heat the the butter and olive oil in a skillet over medium high heat. Add the chicken and cook for about 4 minutes each side, until golden brown and no longer pink inside. Transfer chicken to a platter and keep warm. Mix the cornstarch with water in small bowl and set aside. Cook the mushrooms in the same skillet until tender. Add the chicken broth, dry sherry, and Dijon mustard to the skillet. Stir the sauce, using a whisk to scrape the brown bits from the bottom of the skillet . Add the cream and simmer a few more minutes, stirring constantly. Add the cornstarch/water mixture to the skillet and stir until the sauce is smooth and slightly thickened. Place the chicken back into the sauce to heat slightly. Toss the cooked pasta with a little olive oil and sprinkle with Parmesan cheese if desired. Place the chicken on top of the pasta and spoon the sauce over the top. Sprinkle with chopped parsley and serve. Recipe adapted from one on Valerie's Kitchen.